Guess what? I surprised myself. 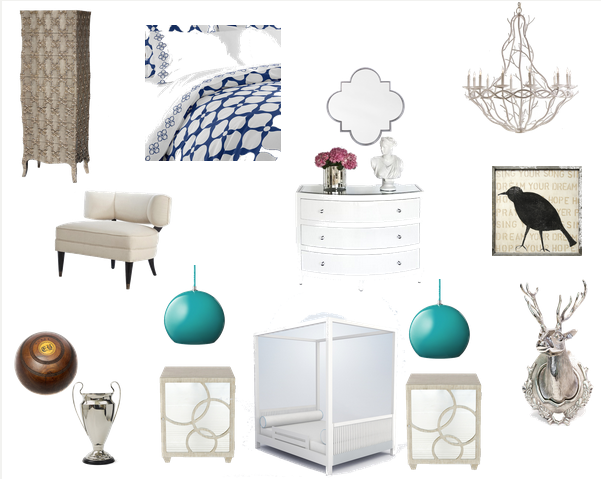 Based on what caught my eye I created a romantic guest bedroom mood board. I suppose my subconscious picked more feminine items for the guest room inspiration board since I live with a boy. Understandably, Husband is not into having pinky pink swirly girlie stuff around. For example he rejected the hot pink rolling tool chest I liked for my workshop because both of us will use it. the Original Pink Box Rolling Cabinet when I saw it on The Antonio Project. You can tell this is an inspiration board because most of the furniture and linens are white. There is no way this room would stay white white very long with Lacey in da house! Semainier Stephanie Odegard Collection - I like the texture of the piece. A traditional tall chest of drawers would overpower a small room unlike this one. Navy Hollywood Duvet Cover Jonathan Adler - I like Jonathan Adler and the crisp blue and white although it doesn't go with the hanging side table lights I also like. The somewhat quatrefoil not but design drew me to the duvet. Silver Leaf Quatrefoil Mirror Mirror Image Home - This is a variation on the black framed quatrefoil mirror I see on many blogs and can't find at a store to buy for my house. Durango 12l Iron Chandelier Arteriors - This iron twig chandelier reminds me of the Anthropologie iron twig canopy bed I drool over. 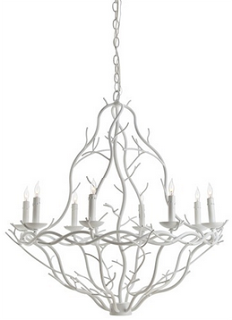 Also, I have a thing for iron chandeliers. Bird Silhouette Sugarboo - Telephone book pages are one of my favorite upcycling materials. This bird piece will fit in around here just fine. Natalie White 3 Drawer Dresser Worlds Away - My guests need a place to put their stuff. A dresser is the traditional choice. I'm surprised I chose this white one. Maybe I am hanging onto my childhood desire of French Provincial furniture that thankfully my parents did not indulge. Laurent Muslin/Solid Wood Chair Arteriors - My guest need a place to sit to put on their shoes. This curvy chair looks like a comfy place to do it. Lawn Ball Europe2you - I'd delete the accessories pictured on the dresser and replace them with the lawn ball and trophy. I have to have a little retro somewhere in a room. We Are The Champions! Go Home - Old trophies are hot in design right now. Unfortunately that means they are hard to come by in consignment shops and cost more than this reproduction. Leah Limed Oak Nightstand Left Worlds Away - My bedroom is too small for two bedside tables but since I'm dreaming I put them on my board. I like the circle detail on the doors. Lacey likes to look at her pretty self in mirrors. Win Win. Vp6 Turquoise Topan & Tradition - Instead of traditional bedside table lamps, I'm going with hanging lamps. I chose this tourquise color before I selected the blue and white bedspread. Fortunately these lamps come in other colors I can choose from. Cabana Canopy Bed Ducduc - I've always wanted a canopy bed. Why not put one in my dream bedroom?I like the clean lines and more contemporary style of the Cabana Canopy Bed although I'd lose the kiddie guard rail. Lodge Deer Head Go Home - No deer where harmed in the making of this aluminum head. I like the shiny. The next step in my design process is to look at the elements that will work together with the craft room inspiration board and the guest bedroom inspiration board which will help me edit the furniture I currently have in the room. It will also give me a guide as to what I want to use as is and what furniture I want to make over and how. Then all I have to do is convince Husband help me paint the room. Do you have any suggestions on how to ask a I Hate DIY Guy to help you paint?